DEAR JERRY: Many artists have a signature song, one instantly connected with them and only them. Tony Bennett's “I Left My Heart in San Francisco”; Wayne Newton's “Danke Schoen”; and Dean Martin's “Everybody Loves Somebody” are three such examples. Yet when it comes to a signature song for Nina Simone, there are at least three different answers: “I Loves You Porgy”; “Mississippi Goddam”: and “My Baby Just Cares for Me,” are all referred to as her most famous recording. As far as I know, Nina's only hit was “I Loves You Porgy,” making it a no-brainer. “My Baby Just Cares for Me” was one of her early singles, but bombed, and I know nothing about “Mississippi Goddam.” I doubt any radio station would have played such a song, at least not in those days. DEAR LUCILLE: I do agree with you … though there is one little proviso: “I Loves You Porgy” is only a no-brainer to folks living in America in the late 1950s and early '60s. Over there, the best-known Nina Simone tune is “My Baby Just Cares for Me” (Bethlehem 3031) — not that listeners on either side of the Atlantic heard it in 1962 when first issued as a single. Both the commercial and the song became wildly popular in Europe, prompting a UK rush-release single of “My Baby Just Cares for Me,” backed with “Love Me Or Leave Me” (Charley CZY-7112). By late November 1987, the tune no one noticed in 1962 held the No. 4 spot on the UK New Musical Express Top 30. Feeding the frenzy, Aardman Animation (“Wallace & Gromit”; “Chicken Run”; “Flushed Away,” etc.) created a magnificent claymation-style video. The Chanel spot and Aardman video are both on YouTube. Which brings us to “Mississippi Goddam.” This is one of seven live cuts on “Nina Simone in Concert,” her first LP for Philips (200135/600135). Issued in June 1964, this collection includes portions of New York performances in March and April. Anyone buying “Nina Simone in Concert” expecting the folk-blues repertoire found on her earlier live albums (“Nina at Town Hall”; “At Newport”; “At the Village Gate”; “At Carnegie Hall”) may have slipped into shock. Simone then uses the four remaining selections, “Old Jim Crow”; “Go Limp”; “Pirate Jenny”; and “Mississippi Goddam,” to sermonize her views on race-related issues. As you suspected, no radio station would even consider airing “Mississippi Goddam.” Flying in the face of reasonable expectations, the label still released the song as a single (Philips 40216). “Mississippi Goddam,” written by Nina, may be her most controversial song, but not her most famous. Neither this tune, nor the one preceding it, “Old Jim Crow” (Philips 40194), stood a chance of being a hit. Even “Nina Simone in Concert” failed to make the Top 100 albums, pretty much the case with all her LPs except “Nina at Newport” (Colpix 412). Simone left America in 1970, landing first in Barbados. In 1992, several countries and continents later, Nina found a permanent home in France, where she remained until her death in April 2003. IZ ZAT SO? In response to negative feedback from the media over “Mississippi Goddam,” in which she sings those words six times, Philips created a custom, promotional 45 rpm for dee jays. A special paper sleeve shows the 'new' title as “Mississippi *@!!? *@!,” along with an explanation of how all mentions of “goddam” is replaced by beeping tones. To say this bizarre concoction was awful is to be as complimentary as possible. Bagdasarian Prods, owner of the Alvin and the Chipmunks franchise, is said to be suing the producers of an "artistically inferior knockoff" Chipmunks tribute album on iTunes, Amazon.com and other digital stores. The lawsuit was filed last Thursday in U.S. District Court in California. The Chipmunks were the created by Ross Bagdasarian, Sr., who in 1958 had the idea of recording his own voice and speeding it up. He made a Grammy-winning chart-topper, "The Chipmunk Song (Christmas Don't Be Late)," and followed it up with an animated TV show, hit feature films, and albums full of hit pop songs done at high speeds. The franchise has made more than $1 billion. In the lawsuit, Bagdasarian Prods. (now controlled by Ross Jr.) claims the Jerry Naylor Company distributed a digital album called "A Tribute to Alvin and the Chipmonks," that uses a nearly identical set of songs to past Chipmunks hits, including "The Chipmunk Song," "Funkytown" and "Mess Around." The fact that the defendant spelled Chipmonks with an "o" and is re-recording past hits from Ray Charles and the Lips, among others, isn't enough to escape Bagdasarian attention. The plaintiffs claim the "knockoff"/tribute infringes its trademarks and is likely to confuse the public on its source of origin. Bagdasarian is seeking more than $1 million in believed damages and an injunction. The Chariot have scheduled an August 2nd release date for the new vinyl LP version of their latest release, 'Long Live.' Long Live was released on November 22nd, 2010 and is the band's fourth full-length album to date. The new 180 gram weight vinyl LP comes with exclusive silk-screened, hand-numbered jackets. Hot Topic will exclusively carry a white version of the vinyl with black spatters, numbered 1 through 1,000. The GOOD FIGHT store, the band (on tour), and your favorite local vinyl retailer will carry black with white spatters, numbered 1,001 through 2000. The vinyl will include a bonus track, 'Music of a Grateful Heart', previously available only on the limited edition 7-inch version. Pink Floyd drummer Nick Mason revealed that the band was simply starstruck when they met the Beatles when the two acts were at the same recording space in the ’60s. In 1957, Buddy Holly recorded the song "Peggy Sue." In 1963, Del Shannon's cover version of the Beatles' "From Me To You" became the first song written by John Lennon and Paul McCartney to appear on the American charts, where it would stay for four weeks, reaching #77. The Beatles' rendition climbed only to #116. The title of the song was inspired from a letters column called From You To Us that ran in the popular British music newspaper, The New Musical Express. In 1966, 500 police are needed to control the crowd when the Beatles play Tokyo. In 1967, Keith Richards was found guilty of allowing his property to be used for the smoking of marijuana and was sentenced to one year in jail and was fined. Mick Jagger was found guilty of illegal possession of pep pills and was sentenced to three months in jail. Pink Floyd's second album "A Saucerful of Secrets" was released in 1968. Also in 1968, Donovan's "Hurdy Gurdy Man" entered the Billboard chart, where it would reach #5. The song featured former Yardbirds guitarist, Jeff Beck. In 1969, the Jimi Hendrix Experience played their last concert on the last day of the Denver Pop Festival. In 1969, soul singer Shorty Long drowned aged 29 after his boat capsized on the Detroit River in Michigan. Had the 1968 U.S. #8 single “Here Comes the Judge.” He acted as an MC for many of the Motown Revue shows and tours. In 1973, Ian Gillan singer with Deep Purple quit the band at the end of a tour in Japan. In 1979, American singer-songwriter, multi-instrumentalist and producer, Lowell George died of a heart attack. The Little Feat front man was found dead at the Key Bridge Marriott Hotel in Arlington, Virginia. In 1985, the Cooper-Hewitt Museum auctions off John Lennon's psychedelic-painted 1965 Rolls-Royce Phantom V at Sotheby's in New York. 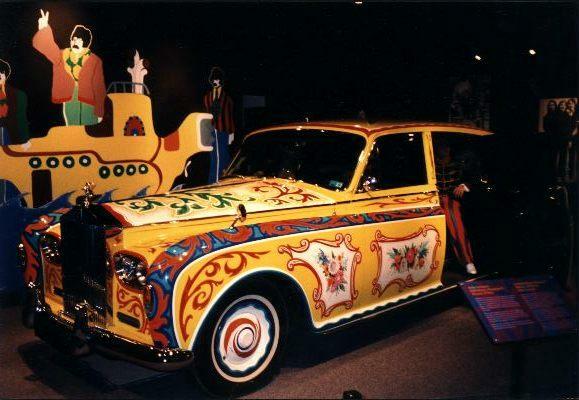 The car, which Lennon donated to the museum in 1977, was sold to the Ripley's Believe It Or Not museum for a then record price of $2,299,000. In 1998, George Harrison announced that he was being treated for throat cancer. Harrison says he has been given a clean bill of health by saying, "I'm not going to die on you folks just yet." That sad event would take place on November 29th, 2001. In 1999, Michael Jackson was severely bruised but nothing was broken when he fell 50 feet during a concert in Munich. In 2007, George McCorkle, the rhythm guitarist for The Marshall Tucker Band, died of cancer at the age of 60. He penned many MTB songs, including the band's first Country Top 40 hit, "Fire on the Mountain".